Print the Coconut Banana Chocolate Chip Cookies recipe here! Print the Chocolate Pumpkin Muffins recipe here! I'm joining in with a show and tell Tuesdays link up with Andrea for the first time. This will be a fun post every other Tuesday to show and tell you something about myself! Today's topic is "Favorite Christmas Tradition or Recipe". I've opted for favorite tradition because it involves baking but not a specific recipe. I love to bake around the holidays to give out treats but through the years I try new recipes and over the last year I have begun to bake Paleo recipes! Baking is sentimental for me and something I've always been able to do for others, especially my dad, so it is a tradition for me to bake him cookies as part of his "gift". I used to make spiked egg nog every year as well but stopped because of the massive amounts of sugar in it! So, back to Paleo baking we go. Preheat your oven to 350* F. Mix the dry ingredients together in a medium mixing bowl, including the shredded coconut. In a separate bowl using a hand mixer, mix together the coconut oil, honey, 1 egg, 1 egg white, vanilla, and mashed banana. When finished, combine with the dry ingredients using the hand mixer and then add in the chocolate chips. You may find you want to use more or less than 1/4 cup so make sure to be mixing them into the batter thoroughly with the hand mixer to evenly disperse them. Scoop out the cookie dough using either an ice cream scoop or a measuring spoon. I used a 1 tbsp. measuring spoon and each cookie was 2 tablespoons of batter. You can use a spoon or fork to shape and flatten the cookies. Place them on a non-stick baking sheet or a greased baking sheet about 2 inches apart. My batch made 20 cookies. I baked them for about 12 minutes until the bottoms were beginning to turn golden brown. Make sure to check on them before then as every oven varies. I adapted my recipe from Skinny Ms. and my first batch almost burned at 15 minutes when the instructions were to bake for 18. My second batch was perfect. So just be cautious! **Note, you can add in nuts or dried cranberries if that's your preference. The cookies are pretty sweet with the shredded coconut so they don't really need chocolate chips! 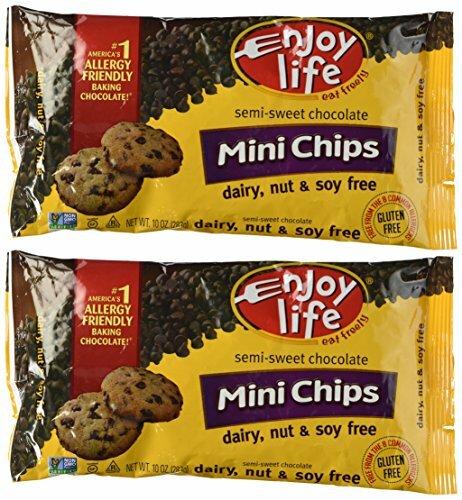 These are the chocolate chips I used that you can sometimes find at the store, but most like will always find at Whole Foods. Preheat your oven to 375* F and spray a 12 piece muffin pan with olive oil baking spray. Combine the ingredients except the chocolate chips into a bowl and blend together very well using a high speed hand mixer or you may do this in a food processor. Once the batter is fully blended and smooth, add in the chocolate chips and blend thoroughly. Fill each muffin cavity 3/4 full of batter. My batch made a perfect 12 count, you may get a little less depending on how full you're filling them. You can add additional chocolate chips on top of the muffins. I finish them off with a sprinkle of sea salt because there's nothing better than a salty/sweet combination! Bake the muffins for 15-18 minutes and check on them by inserting a toothpick into the center of the muffin. If the toothpick comes out clean then they are done. Let the muffins cool 5-10 minutes before removing them from the pan. These are great as a dessert, a snack, or breakfast if you allow chocolate for breakfast! I adapted my recipe from this one here. I'd love to hear what your favorite Christmas tradition or recipe is so please comment below! You can now print my recipes at the very top of these posts which is something new I've recently figured out how to do and have gone back to add that in to previous posts with recipes.